I’ve struggled with the concepts of change and control for as long as memory serves. If I’m in control of change, I embrace it, enjoying the process of reinvention, the assimilation of new knowledge, and the thrill of foreign geographies and experiences. But when change happens to me, instead of being instigated by me, I frequently resist; I’d rather grasp onto an old reality than accept a new one. I have to partially blame this pattern on school. Academia teaches its students a goal-oriented, control-oriented approach to life. Before each achievement, you may struggle, gnash your teeth, bemoan that end target, but you’re doing all of this whining within very specific constraints, and despite other unknowns, there’s a clear finale. Until recently, I approached my life in a similar fashion. I’d create a goal for myself, whether interpersonal, professional, or athletic, then willingly put in the work and the long hours, all with the hopes of controlling how I’d succeed...and when. What I failed to anticipate as an adult was that life isn’t a linear pattern of assignment-work-achievement and that even when one does meet certain goals, life continues forward in its rather messy fashion. To put this in cooking terms, when I first began to familiarize myself with the kitchen years ago, I did feel as if I was in school. I started out knowing very little, and thus, every book I read, and every dish I created, was an achievement – mini progress reports on the way to the ultimate goal of becoming a competent cook. And then, I became one. Because I didn’t graduate from an official Cooking 101 class, and I can’t pinpoint the particular moment that I became a person with a repertoire of favorite recipes and preferred flavors, along with opinions on specific ingredients and all of the requisite kitchen equipment needed for specific tasks. Despite my competence and confidence, I continue to create mini-goals for myself such as cooking with ingredients I’ve only dabbled with previously, and becoming a bread baker. I imagine I’ll always pursue these kind of specific cooking goals, but recently I’ve felt a shift in my concept of cooking “achievement” that mimics an interpersonal shift in my own life. I used to believe that if I worked hard enough at a relationship or my career then friendships would prosper and my career would soar. But, this concept of control is tricky. I can work hard, I can be a good friend, and yet friendships fizzle and career movement isn’t solely built around hard work. In the past, with these kind of adversities, I assumed I just needed to try harder. This year, I’ve absorbed a brighter side to a series of personal challenges and disappointments: I’ve quietly realized that while I should put effort into anything I do, things may not work out the way I want them to. And in tandem with that concept, even if something or someone is a positive aspect of your life one day, it might not be the next. Life is a series of changes, and realizing this doesn’t mean giving up, but it does mean relinquishing control. This lesson is true in the kitchen, forever a microcosm of my larger life. The cookbooks I used to turn to eight years ago are mostly gone. The flavors I was intrigued by five years ago are either “old hat” or not even sought out. 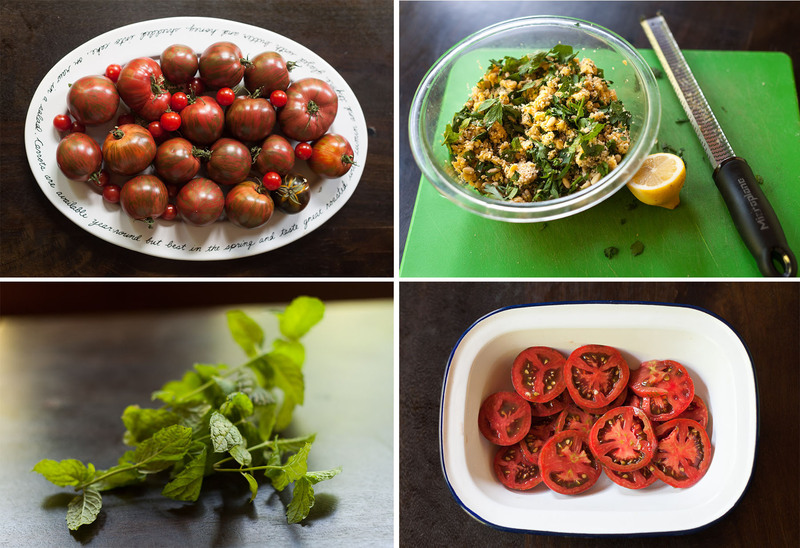 I still shuffle ingredients into my kitchen seasonally – I can definitively say that that won’t change (an example of something I can control!). But, as my knowledge and time in the kitchen continues to multiply, my own nutritional needs and awareness have changed in tandem. I’m not the same person or cook I was five years ago, and I no longer expect this static sameness from other people or experiences. This summer, we’ve cooked nearly every meal at home. 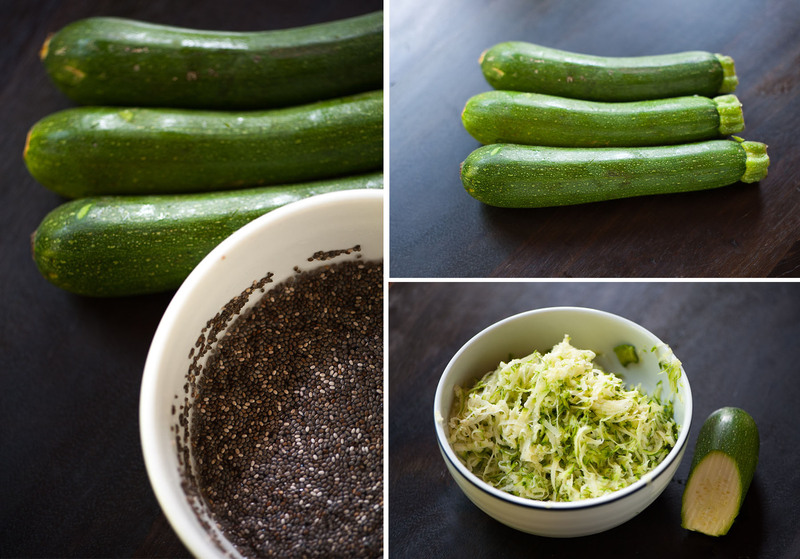 Each previous summer is fondly remembered by that season’s go-to ingredients; last year it was eggplant, before that, zucchini and corn. 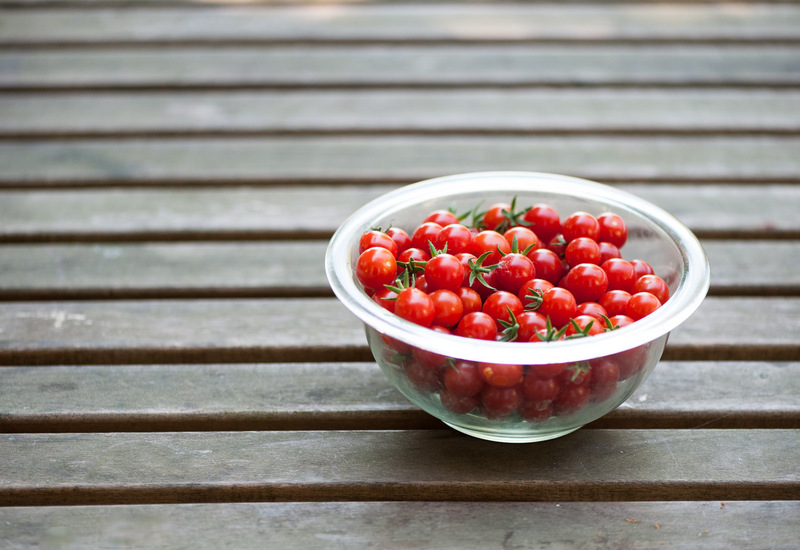 This year, our summer kitchen was 100% tomato, thanks to the incredibly productive plants dotting our front, side, and back yards. 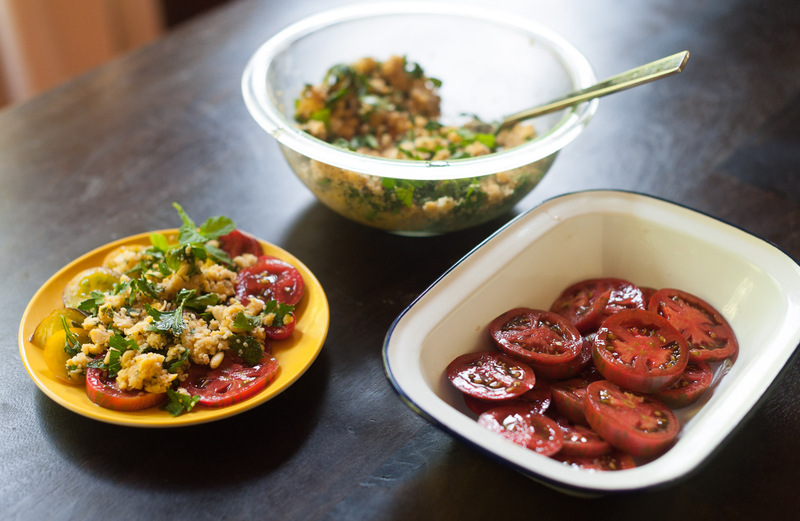 But, while tomatoes are a familiar ingredient, we’ve gravitated to an entirely different set of tomato recipes this summer, replacing old favorites with new ones, as our own tastes and needs change. 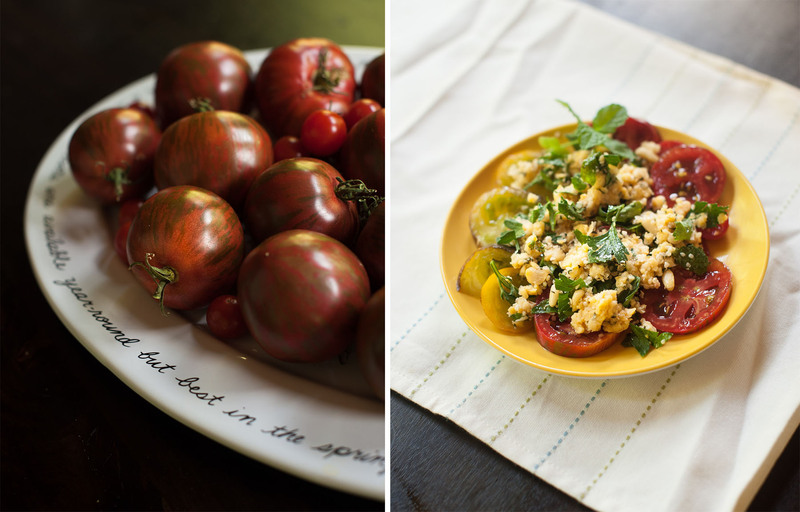 I’ve become captivated by two new cookbooks, My New Roots and A Modern Way to Eat. My husband and I are runners and fairly active in our daily lives – when we’re not sitting at computers, that is. Because we burn a lot of calories, we often feel hungry. About a year ago, we unwittingly fell into a justifiable cycle. The clock would strike 3 and we’d head out the door for coffee and some sort of baked good – a scone, muffin, or cookie. We wanted to escape our home offices, yes, but there was a bigger problem: after a few years of sugary snacking, our bodies demanded an infusion of sucrose. In a classic case of compartmentalization, though I was cooking with seasonal whole foods at home, I piled cookies and scones on top of all our farm or garden fresh vegetables when I went out, shruggingly accepting the low blood sugar crashes and the resulting bad moods. Despite maintaining physical fitness, my running endurance, energy, and caloric demands had settled into a similarly inconsistent pattern. I’d experience blood sugar crashes after three miles of running and then run eight miles on my next outing without needing any caloric intake. I’d battle stomach aches and racing heartbeats, each outing a perpetual mystery. After a particularly bad run, I finally stopped thinking that escaping a home office or chomping into a lemon scone justified these physical maladies. I believe in the healing ability of healthy eating and yet I was only practicing these concepts about 80% of the time, while suffering the other 20%. I needed a burst of inspiration to break this ingrained, sugar-crash driven cycle, and I found one through Sarah Britton’s My New Roots. 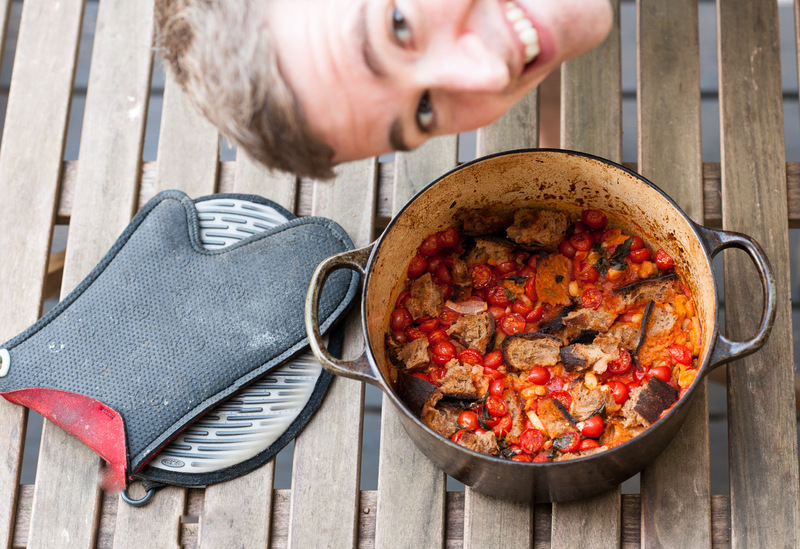 Britton writes a much admired blog of the same name, creating beautifully photographed recipes from whole foods – you know, the exact kind of food it seems eeryone is publishing online these days. But what sets Britton’s recipes apart is that her meals are focused on a triumvirate of nutrition, flavor, and attractiveness; all three must play a role. She’s not interested in sacrificing nutrition for the sake of a pretty plate, just as she’d never promote a tiny leafy salad as a filling lunch just because it looks delicately irresistible. I’ve cooked and baked with whole grains for several years, but My New Roots has challenged me to integrate other nutritional powerhouses into my current repertoire of seasonal vegetarian eating. This summer we stocked up on chia seeds, hemp seeds, and coconut oil, and our meals, especially our lunches, have become more dense and filling, a situation that basically negates the need for an afternoon snack. Buoyed by our renewed energy and enthusiasm (and my more consistent running), in July we bought Anna Jones’ A Modern Way to Eat, a massive volume of vegetarian recipes that also manage to fill, impress, and satisfy. Just as Britton turns to her favorite ingredients of hemp and chia seeds, Jones adores coconut in all forms, along with ginger, and every bean imaginable. Thanks to its versatility, A Modern Way to Eat trumps nearly any other vegetarian cookbook I own; I reach for it again and again. She invites you to add your own spin to salads and soups and all of her recipes are written in a conversational and trustworthy manner: she knows you know how to cook. The recipes are flavorful, flexible, and incredibly simple, and we’ve found ourselves surprised by how much enjoyment can come from a simple roast potato and tomato dinner when you add in beans and onions. Jones knows how to take familiar staples – things you eat because you should – and add a few extra layers on top to make them both crave-able and filling. As a bonus, both books features copious ideas for snacks and baked goods that are less reliant on sugar and more focused on seeds and the integration of whole foods. 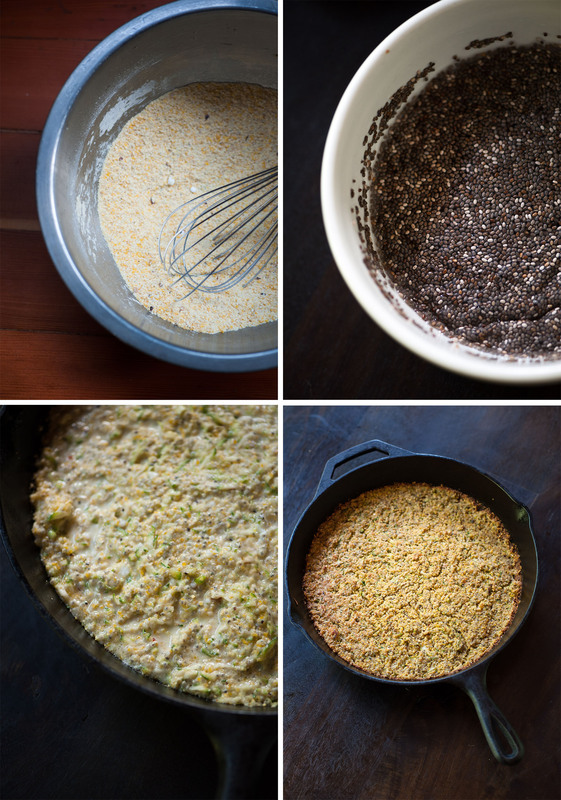 We’ve cooked Britton’s zucchini firecracker cornbread throughout the summer, initially intrigued by the addition of chia seed paste, and now completely addicted to its enveloping yet lighter taste. And as far as tomatoes, our two favorite ways to quickly power through our garden that won’t stop producing are a dish from each woman’s book: a tomato and bean cassoulet boosted by the addition of coconut milk and ginger and homemade bread, and a grain-free tabbouleh that my parents couldn’t stop eating on their last visit. The texture stems from hemp seeds – a true nutritional powerhouse – and pine nuts, and the compelling flavor comes from the mint and olive oil dressing. Britton and Jones haven’t entirely reinvented the wheel of healthier vegetarian cooking, but they have changed the shape of that wheel. Their vegetarian recipes are bigger and bolder: more appealing, more filling, more attractive. These adjectives are achieved by the addition of healthy ingredients that I used to eat when I felt the beginnings of a cold, or after a few days of airplane food, but now integrate because each seed, nut, or grain has a natural place in their recipes. I’ll discover new recipes next summer, as my own needs and tastes continue to evolve, but I suspect that this newfound integration of flavor-forward vegetarian meals that create a sustainable feeling of fullness will remain with us for years to come, mingling with the lessons I’ve learned in the past and the curiosity, and uncontrolled life, still to come. Preheat the oven to 400ºF. Put a 9 inch cast-iron skillet into the oven to heat it up. Mix the chia seeds with 1/2 cup water in a small bowl and set aside to gel. It should take 15 minutes to attain the right consistency. In a large bowl, sift the cornmeal, corn flour, baking powder, baking soda, salt, and red pepper flakes together. Add the wet mixture to the dry, and combine in as few strokes as possible. Fold in the zucchini and scallions. 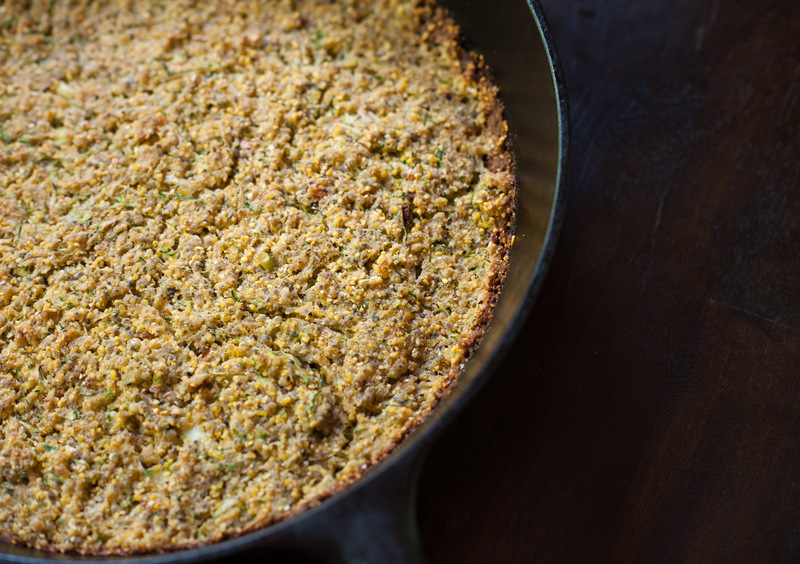 Carefully remove the hot skillet from the oven and add the butter or ghee to coat the pan. Pour the batter into the skillet, scraping out any batter remaining in the bowl. Baking until the edges are golden brown and a toothpick inserted along the edge comes out clean, about 25 minutes. Let cool for around 30 minutes before slicing into wedges. Enjoy! Make the dressing: Whisk the olive oil, lemon juice, garlic, honey, and salt together in a small bowl. Pour this over the salad, tossing to combine. Slice the tomatoes into thick steaks and arrange them on individual plates. Drizzle with a little olive oil and sprinkle with flaky sea salt. 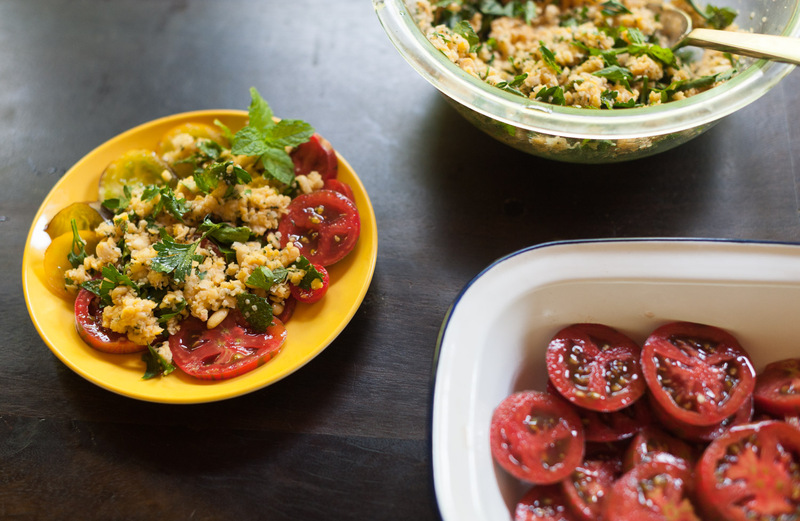 Spoon the tabbouleh salad over the tomatoes, and serve. Enjoy! 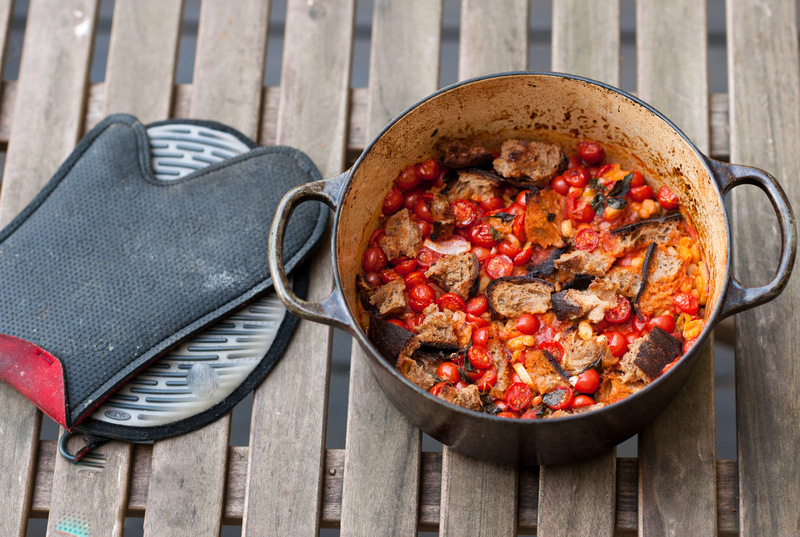 Heat an overproof pan (a dutch oven works well) over medium heat and add a splash of olive oil. Add the leek, garlic, chile, ginger, and a pinch of salt and pepper, and then turn the heat down. Cook for the next 10 minutes until the leeks are soft and sweet. Then, add the canned tomatoes, coconut milk, and beans, simmer for a couple of minutes, and then take off the heat. Check the seasoning. Add the fresh tomatoes, followed by the basil. 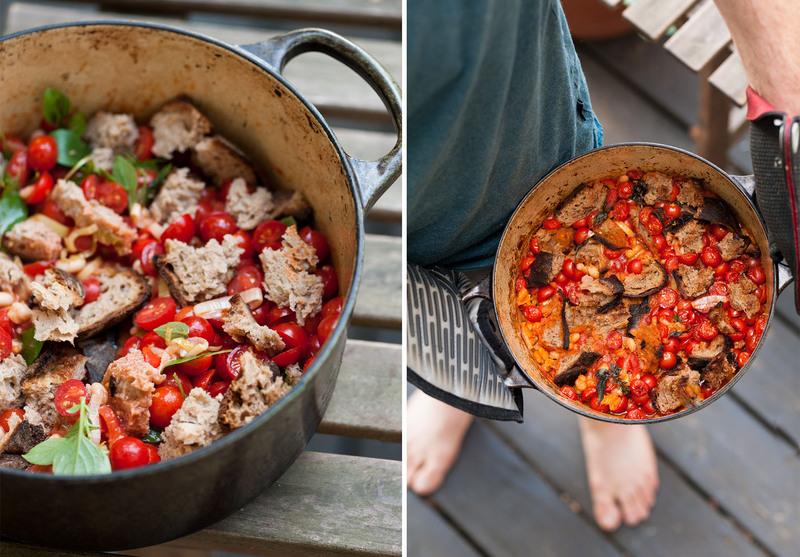 Then tear the slices of bread into chunks and push them into the gaps between the tomatoes. Drizzle with olive oil and bake for 30 minutes until the tomatoes have shrunk and sweetened and the bread is crisp and golden. Allow to sit for a few minutes. Enjoy!